Metamorphoseon, libri XI: Edidit Rudolfus Helm. 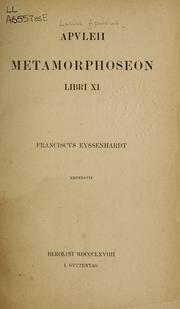 L. Apuleii Metamorphoseos, siue lusus asini libri XI. Floridoru[m] III. De deo Socratis I. 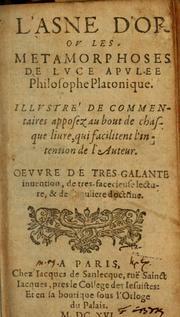 De philosophia I. Asclepius Trismegisti dialogus eode[m] Apuleio i[n]terprete. Eiusdem Apuleii liber de dogmatis platonicis ..
Qvae in toto opere continentvr: Metamorphoseon siue De asino aureo, libro XI. Floridorum, libri IIII. De deo Socratis libellus. 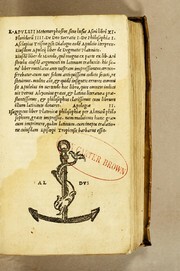 Apologiae, libri II. Trismegisti dialogus. De mundo, siue De cosmographia liber I. Omnes ante nostram impressionem mutilati, nunc autem ad fidem uetustissimi codicis, diligentissime recogniti ac castigati. The xi. 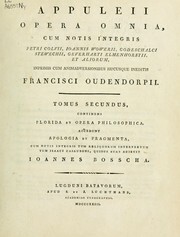 bookes of the Golden asse: containing the metamorphosie of Lucius Apuleius, enterlaced with sundrie pleasant and delectable tales, with an excellent narration of the marriage of Cupid and Psyches, set out in the iiij. v. and vi. bookes. Translated out of Latine into English by William Adlington. 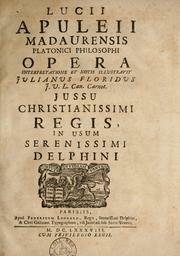 Apvleii Madavrensis opera omnia qvæ exstant: ab innumeris mendis, quibus hactenus scatebant, iam ferio emendata. The Xl. bookes of the Golden asse: containing the Metamorphosie of Lucius Apuleius, interlaced with sundry pleasant and delectable tales : with an excellent narration of the marriage of Cupid and Psyches, set out in the fourth, fifth, and the sixth bookes. 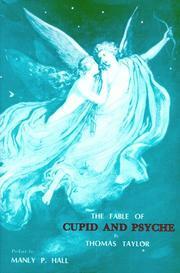 The Fable Of Cupid And Psyche: translated from the Latin of Apuleius: to which are added, a poetical paraphrase on the speech of Diotima, in the Banquet of Plato ; four hymns, &c. &c. With an introduction, in which the meaning of the fable is unfolded.